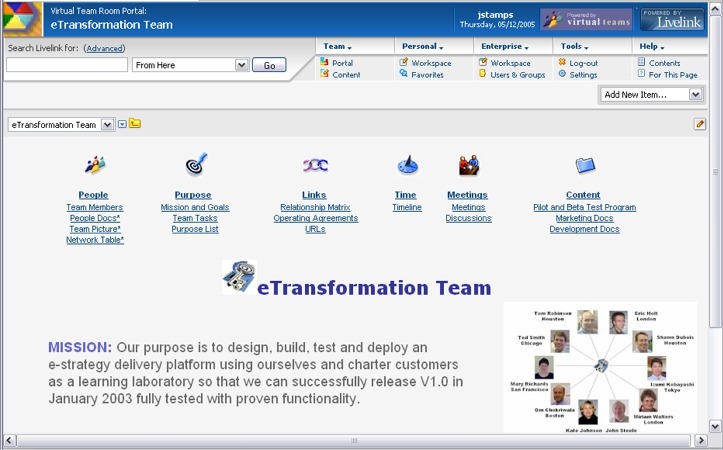 Livelink virtualteams, our first team room, is built on the Livelink collaboration platform from Open Text. It was requested by Royal Dutch Shell, a client who had chosen Livelink as its knowledge management (KM) platform. It is software with behavioral tools for setting up, launching, and managing virtual teams. It combines globally recognized, time-tested methodology for virtual teamwork with state-of-the-art collaboration technology. Livelink virtualteams is based on 20 years of research by NetAge founders, Jessica Lipnack and Jeffrey Stamps. Coupled with Livelink's information management capabilities, it makes it easy for team members to focus on work rather than technology. Lets people work together effectively and efficiently wherever they are. Combines an intuitive environment with an enterprise content management system that enhances knowledge sharing. Makes team meetings more productive. Provides virtual meeting places for real-time collaboration that are linked to over-time data repositories. Gives team members have round-the-clock access to their secure virtual team workspace, providing a "sense of place" where they can meet, capture, organize, and publish information, interact and hold discussions, provide up-to-date snapshots of team progress, and develop team trust.